Poinsettias have long been the traditional Christmas plant and a classic Holiday gift. Learn how to keep yours healthy and reblooming. Once viewed as a weed in Mexico, the red Poinsettia has risen to the status of most popular Christmas plant. In its’ native Central America and Mexico, the Poinsettia grows to a woody shrub reaching ten feet high. Grown primarily as a houseplant in North America, the tropical Poinsettia will require some special attention. If you take proper care of your poinsettia and keep it healthy through the holidays, it can also rebloom for you the following Christmas. Initially your objective will be to maintain the beautiful blooms as long as possible through and after the holidays. Winter flowering plants of course will need plenty of sunlight, but it should be indirect light such as north facing. Ideally you should position the plant in the sill of a double or triple glazed window so the plant stays plenty warm. 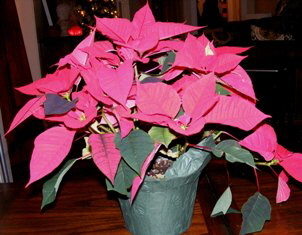 But also avoid placing the poinsettia so close to a radiator or heat vent that it dries out quickly. Remember that a poinsettia is a tropical plant that enjoys warmth and moisture. Water thoroughly and remove any excess water from the drip saucer to avoid keeping the soil wet. Do not water again until the container soil because quite dry. And since potting soil will quickly deplete of nutrients, use a 10-10-10 fertilizer about every 4 weeks. After the holidays begin to limit watering and do not fertilize to encourage dormancy. By April your poinsettia color will begin to fade and the plant may begin to lose petals and leaves. If you care for it properly after this point, you can have an even better Christmas Poinsettia next year. Prune all stems back to about 4 to 6 inches high and transplant to a larger container with fresh potting soil. As soon as it is warm enough outside, the poinsettia can be hardened off and kept outside in a bright but protected spot. Pinch the branch tips periodically until mid summer to produce a full plant. Begin again to keep the soil moist and fertilize monthly. By September you will need to begin preparations for a Christmas bloom. Bring the plant indoors and again find a warm spot that receives indirect sunlight. The plant requires total darkness at least 12-14 hours a day for about 8 weeks to produce blooms. You can move it to a dark closet that will not be opened for 14 hours or cover the plant with a box each day. Depending on your work schedule you may need to cover the poinsettia immediately when you get home from work and uncover it immediately when you wake up in the morning. As soon as flowering begins and a little color develops, reduce the length of darkness and begin regular watering and feeding. Voila! Bigger, better, more beautiful poinsettia than last year.